Opportunities and challenges for company, teams and individuals. Technology is changing the business and society – today’s business, work, and product world is getting more VUCA (*VUCA = volatile, uncertain, complex, ambiguous). This is the reason why not everything that is right today will still be right tomorrow. People also want to work more independently than they have been allowed to in companies with classic hierarchical structure so far. In order to be competitive and future-oriented, companies should become more agile. It might sound simple but it must be well considered and prepared to recognize possible resistance at an early stage in order to achieve satisfying results. We support you on your way as an agile company. 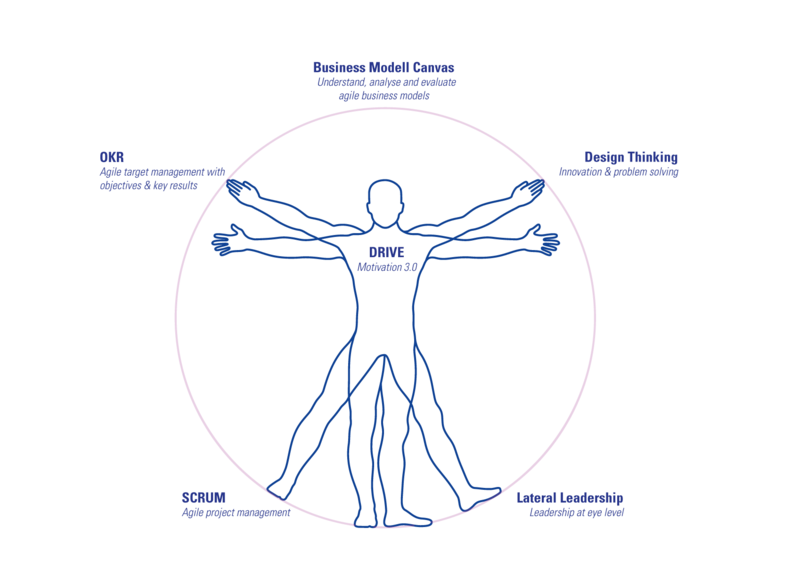 In times of the digital transformation and a continuous (digital) disruption, leaders need a combination of the right mindset, skillset, and toolset. To get the toolset you need as an agile leader, we have put together a set of six tools to support you. Invoke your innovation and problem-solving potential! Design thinking is a creative and solution-oriented way to think and work. The concept helps you to find the best solutions for complex problems in all areas and can be applied to a large number of questions. Key elements of this agile methods are the interdisciplinary and flexible rooms. Agile approach wherever knowledge work happens! Many companies want to implement agile leadership in their company because the classical leadership is no longer the right approach in a complex environment. The Scrum approach exists for more than 15 years and is an internationally valid method. Originally developed for IT companies, it provides valuable tools and structures wherever knowledge work happens and where solutions and new processes are needed. Leading like in Silicon Valley! Successful examples such as Google, Facebook & Co. are often considered as desirable and now seem to be within reach with the OKR system. Through well-defined objectives and key results, this agile framework stands for corporate and employee leadership. It gives us the opportunity to react adequately to today’s flexible and insecure business world and allows us to find individual solutions for different challenges – together as a team. Orientation and definition: what is agile leadership, what is not? Self-Assessment: how agile am I as a leader at the moment? How agile are we as a team and company? Implementation plan: how do we introduce agile methods to our company? In this video, our agile leadership trainer Alexandra Sock talks about the objectives, the target group and the content of the workshop. She explains the benefits of the in-house developed self-assessment and gives some practical tips that can be implemented in your own company the next day. 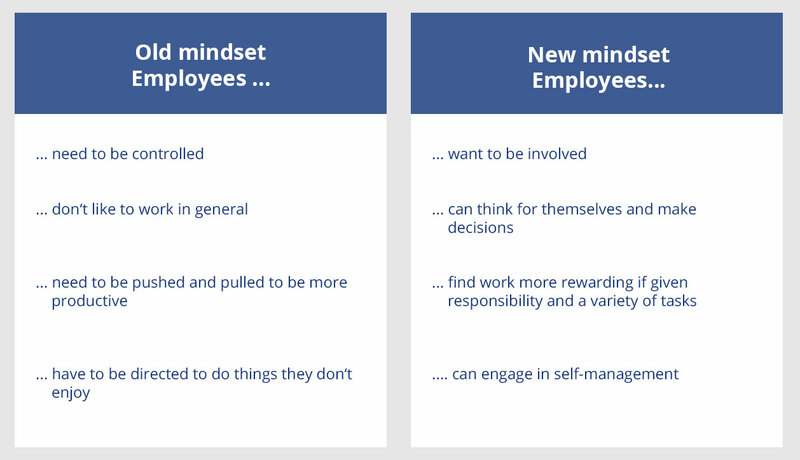 Agile leadership is a mind-set that starts with yourself. The interaction of all participants with each other, as well as the relation to their own tasks and the work in general, are key aspects. What drives us? How do we work together? How do we deal with each other? How much transparency do we allow? How much control are we willing to take? Introducing agile methods only makes sense if the answers to all these questions already show a glimpse of “agile thinking” and if the persons involved have the right self-assessment. Agile leadership is a complex concept. When we about agile leadership, we talk about three different levels in general: the individual, team and organization level. If you want to implement agile methods you must start with yourself and with self-understanding and self-responsibility. To become agile as an individual, you must first analyze the status quo: How transparent and independently do I work at the moment and how many responsibilities do I bear? If I currently work in a very hierarchical-oriented team with clear instructions from the supervisor, the introduction to an independent and agile way of work can be relatively difficult. If I already have a lot of freedom and if I am allowed to work almost independently, the difference to agile methods is perhaps hardly noticeable. Constant coordination, exchange, and communication among each other are the biggest challenges for a team in an agile setting. Agile methods require openness and extraversion of all the team members on the one hand and the right tools on the other hand. When introducing agile leadership to a team, it is worth to invest in the communication structure and skills of all members to avoid difficulties. The entire organization must be ready to establish agile structures, to soften hierarchies and to question the status quo. And the employees must be allowed to question the status quo repeatedly. The constant questioning and the much flatter hierarchies can be presented as a loss of control for the management, which is instinctively something to avoid. This is one reason why the introduction of agile methods is very challenging on the organization level. It takes a lot of openness and a real commitment to moving away from rigid rules and procedures in order to implement agile leadership successfully. What is behind the hype and what benefits does the concept have? What are the beneftis of OKR? Leading like Silicon Valley’s leaders – with OKR. What’s the big deal about digital transformation? Is it more than just a buzzword? Experience report from the CEO of MDI. Introduction to SCRUM, the oldest agile method.